I haven't been the biggest fan of the PlayStation Vita's remote play function. 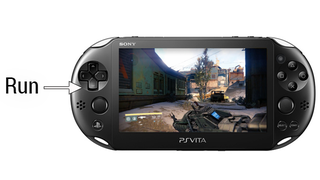 It sounds great in theory—use your Vita to stream games from your PS4, play games in bed or on the go! But it never works quite like I want it to. One of the issues for me has been lag, but lately, that's been much less of an issue. As long as I set the PS4 to beam directly to the Vita (rather than using my home's wireless network), and as long as I keep the Vita within about a room's distance from the console, the lag I get is small enough that I don't care. Sony's workarounds—at least when it comes to big-budget games that use the whole controller—have never done it for me. Some games have a default setup that puts the thumbsticks and the shoulder buttons on the four corners of the Vita's back touchpad, which is truly awful. Some Sony-published games have custom layouts, but those still aren't that great—they usually re-assign crucial gameplay buttons to the rear pad or assign different buttons to the four corners of the front touchscreen. Then, along came Destiny. I've already talked at length about how much I like Destiny's control scheme, though I wouldn't have predicted that it would work all that well on the Vita. Thanks to a single smart control remapping, it does. I was intrigued. Mapping the run button to the d-pad instead of a the front or back touchpad? Interesting idea. Good news: It works really well. Turns out, the run command needs to be mapped to a button. It feels awful when mapped to a touchscreen, either on the front or back of the Vita. Assigning it to the d-pad is smart, since you push your left thumb up to move forward in the first place, so you're already near the d-pad button when you want to run. Quickly clicking it feels natural. It all starts with that run button, though. There were three crucial gameplay commands that needed new homes after the move from PS4 to Vita: Run, Grenade, and Melee. The front touch screen can only comfortably accommodate two of those, since the right and left sides are the only places that feel consistent to use in the heat of the moment. By getting the run command mapped and out of the way, Bungie made room for the other two commands. It's nice that Bungie took the extra time to create a custom remote play control setup for Destiny, and even nicer that they managed to come up with one that works so well. If more games can have remote play controls this good, I'll definitely use the feature more.